Darling Sweet has, over the last few years, firmly established itself as a South African brand of top quality handcrafted toffees and toffee spreads. Owners Hentie van der Merwe and Frits van Ryneveld started the brand in July 2014 in a small 24m² kitchen at the Mantis Mall in Darling. As the demand for their products took off exponentially they soon had to look for bigger production space. At the end of 2015 they had the good fortune to acquire the stately Edwardian building on Long street that used to house Darling’s General Dealer or “Retief se Winkel”. They set about converting this elegant 500m² space into a state-of-the-art production facility and in January last year the Darling Sweet team moved in and opened its doors to the public. Visitors to Darling Sweet are welcomed through exquisite wooden doors into an old-world toffee shop. From here the production process can be viewed through huge glass panes and the entire Darling Sweet product range can be sampled and bought. Hentie and Frits recently decided to add to visitors’ experience by converting the beautifully proportioned room next to the shop, with its high ceiling and wooden floor, into an exhibition space for art, seeing as Darling sorely lacked such a space. Hentie, with his knowledge and background firmly rooted in the South African and international art world is the gallery’s curator. He plans to regularly invite guest curators to put together exhibitions of their choice for the gallery. The Toffee Gallery will showcase the work of artists at the forefront of contemporary art practice in South Africa and abroad. The Toffee Gallery was launched on Saturday 22 April during a packed opening of its first exhibition featuring the work of Robert Hodgins (1920-2010) and Michael Taylor (1979- ); two brilliant painters and printmakers from two very different generations in South Africa. Hayden Proud from the Iziko National Art Museum in Cape Town opened the exhibition. 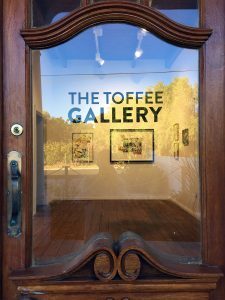 Making mention of The Toffee Gallery deriving its name due to its status as benefactor of the toffee industry that is Darling Sweet to keep its doors open, he referred to art’s reciprocal relationship to industry and how it has often been the basis of many a success story. The current exhibition, ‘Relief’ opened on Saturday 4 June at 11h30 and features large-scale relief prints on a substrate made from cotton fabric and printed at Warren Editions in Cape Town. The exhibition features work by Vulindlela Nyoni, Gabrielle Raaff, Daniella Mooney and Peter Eastman. Each artist’s work demonstrates a different exploration of the medium of relief printing as guided by his or her own style and sensibility, in collaboration with a master printer from Warren Editions. The works included on this exhibition are extraordinary examples of the intricacy and complexity achievable with relief printing, and are indicative of the pride Warren Editions takes in defining the limits of various printmaking techniques. The works are also expansive in terms of their scale, which is made possible by the very large press at Warren Editions, the largest in the Southern hemisphere.